The 2019 TRP Distributors South African National Motocross Championship heads to Cape Town for its second round Saturday 30 March, when the sandy and tortuous Zone 7 welcomes the cream of the local crop to fight it out over longer race formats. The new twenty-five minute open class races delivered varied results at the PE season opener, so Cape race fans can look forward to more of the same at the Zone. Lloyd Vercueil (Summit Racing Yamaha) was quick out the box in 450cc MX1 but ended up sharing the honours with moto 2 winner, Q4 Fuels Husqvarna star Maddy Malan, who takes the championship leader’s red backed number plate to the Cape. Royce Griffin (RPG KTM) impressed in PE, while Red Bull KTM duo, Tristan Purdon, who returns from a winning trip to the US and Kerim Fitzgerald and David Goosen (Tintswalo Yamaha) will be keen to take the chequer first this weekend after all endured challenges through the PE opener. 250cc MX2 is the class to win this year, with a huge field of riders chasing TRP SA motocross glory, but High School graduate and championship leader Cameron Durow (OC KTM) is the man to beat there. He will however have PE race 2 winner, Q4 Fuels Husqvarna rider Nick Adams and local hero Anthony Raynard’s Tintswalo Yamaha to deal with, while Kerim Fitzgerald, Bradley Cox, Johan Vogelslang, Joshua Mlimi and Slade Smith (Husqvarna) are all out to improve on their championship lot. It’s a case of red plates all-round in the OC KTM camp, as Cameron Durrow shares the High School title lead with SA’s German MX champion Camden McLellan’s similar KTM. With McLellan back in Europe, Durrow will have SA champion Justin Sangster, Dalton Venter (Husqvarna), Ethan Hoffman and Arnu Saaiman to deal with in another full field of testosterone induced youngsters in the Cape. Barend du Toit took double 85cc Junior honours aboard his Raceworx KTM in PE, so he’s another with a target on his back this weekend as the similar machines of Seth Young, Seth Whitington and Deegan Bloomfield chase him down. Dylan Kirk (TRP KTM) and Nate McLellan will continue their 85cc Mini Pro battle at Zone 7, with Blake Young, Daiyaan Manuel, Stav Orland and Leonard du Toit’s KTMs running interference. Niel van der Vyver rode his Q4 Fuels Husqvarna to a dominant double victory in the 30-strong junior school 65cc field in Port Elizabeth, but Zone 7 is his home track and the young Capetonian does not intend to take any prisoners this weekend. He will however have the similar Husqvarnas of Liam Botha and Jordan van Wyk chasing him down, while KTM kids Troy Cox, Timo Maxino Toepfer and Pieter Brink will also be chasing Cape glory. The 50cc lighties make up the youngest TRP SA Motocross class and Ethan Williamson is the lad to beat there on his Husqvarna, but there’s a quartet of KTMs ridden by Jake van Schoor, Keenan Strauss, Christian Berrington-Smith and Riley Wium and Coby Hart on another Husqvarna, all keen to take him off that podium top spot. Kayla Raaf (DForce Racing KTM) tussling with similar machines of Leah Heygale and Natasha Rugani in the popular Ladies class, while MX3 will see Stuart Laing (Slake Enduro KTM) chase more over-30 wins with Dillon Simpson (KTM), Wade Wright and Jonathan Hubbard chasing him down, but the returning Wyatt Avis will be an extra attraction there. It's just as competitive among the over-40s where Craig Kruger (KTM PE), Brett Bircher (Alfie Cox Motul KTM) and Quinsley Sale (KTM) top the title log. The 2019 South African National Motocross Championship is delivered by TRP Distributors in association with Dragon Energy, Prepsol, Bridgestone, Thor, Gaerne, FMF, Motul, Pro-Taper, Fly Racing, 100%, Ogio Luggage, Racestar Graffix and the Race Shop. 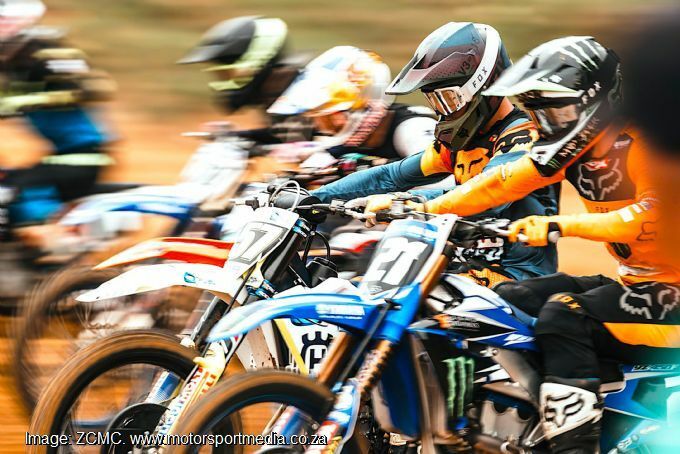 Zone 7 is a splendid venue to watch motocross with full amenities and catering; there’s great commentary and entertainment and action par excellence — why not make a turn there for the TRP Distributors South African National Motocross Nationals on 30 March? Find Zone 7 on Van Schoorsdrift Rd, Cape Farms, Cape Town just off the N7 to Malmesbury.